John Joseph Harrington Jr. was born on 21st October 1978, in Portland, Oregon USA, and is a retired American Football quarterback, who played for NFL teams Detroit Lions, Miami Dolphins, Atlanta Falcons and New Orleans Saints. His career was active from 2002 until 2009, when he retired. Have you ever wondered how rich Joey Harrington is, as of late 2016? According to authoritative sources, it has been estimated that Joey`s net worth is as high as $2 million, earned through his career as an NFL player, but also his net worth has benefited from his work as a radio commentator and color analyst. Joey comes from a family of footballers; his father and grandfather were quarterbacks for the University of Portland and Oregon, and since he was old enough he was taught to become one. Joey went to Central Catholic High School in his hometown, where he began playing football. The four years he played there, Joey amassed 4,200 yards and 50 touchdowns, combined rushing and passing. After high school, Joey enrolled at the University of Oregon on a sports scholarship, and proved he was worthy of one. He led his team to an overall 25-3 record, and had 7,121 yards in total, which earned him a third place in Oregon`s history. He received several honors, including first-team All-American, and Pac-10 Offensive player of the Year in 2001, among others. Thanks to his great performance in college, Joey earned a high draft position, and was selected as the third player by the Detroit Lions in the 2002 NFL Draft. In his first season with the Lions, Joey played in 14 games, 12 of them starts, and had 2,294 yards and 12 touchdowns, with 16 interceptions; this earned him Detroit Lions/Detroit Sports Broadcasters Association Rookie of the Year Award. His third season with the Lions was his most successful; he had 3,047 yards for 19 touchdowns and with only 12 interceptions. This earned him a 77.5 quarterback rating, however he was still miles away from expectations, and as a result, in 2006 he was traded to the Miami Dolphins. 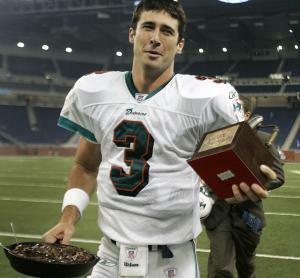 That season, Joey played in 11 games for the Dolphins, and led them to a 5-6 record, with 12 touchdowns and 15 interceptions. The following year he signed a contract with the Atlanta Falcons, worth $6 million over two years, but played only a year and in 12 games. He was released and re-signed several times, before eventually being released for good. After Falcons, his next stop was New Orleans and the Saints, but he didn`t make a single appearance for the team, and after a series of injuries was released by the team, and decided to retire in 2007. After retirement, he became an analyst and commentator; firstly he worked for Fox Sports Radio in 2009, and the following year he served as color analyst on Oregon Sports Network, covering Oregon Ducks football games. At this time, he works for FX and Fox, as a college football analyst, on the show Fox College Football, which contributes to his net worth. Regarding his personal life, Joey has been married to his college sweetheart Emily Haten since 2007; the couple has two children together. Joey is also a well-known philanthropist; he started the Harrington Family Foundation in 2003, with a main focus on improving education for youth. He used a part of the amount he received when he signed with the Lions, and since then has raised money from sending memorabilia, including pictures and jerseys among other stuff. In 2011 he suffered several injuries, including broken collarbone and fractured ribs, after being struck by an SUV while riding a bicycle. He has recuperated from injuries. 1 (September 25 2008) Released by the New Orleans Saints five days after signing him. 3 NFL quarterback who after a standout career at the University of Oregon, was taken with the third overall pick in the 2002 Draft by the Detroit Lions. 4 Is a classically trained pianist.